Nomadic Tents Marquee Hire Sunshine Coast have a wide range of unique, colourful marquees that are truly spectacular. These amazing structures create a fantastic atmosphere,especially at night. Best of all they can be erected on just about any surface,even split levels, and are great value. We can assist with venues,have wonderful lighting systems, and can help with your planning. Whether your event is large or small, in the bush or the beach,we have a colourful marquee to fit. 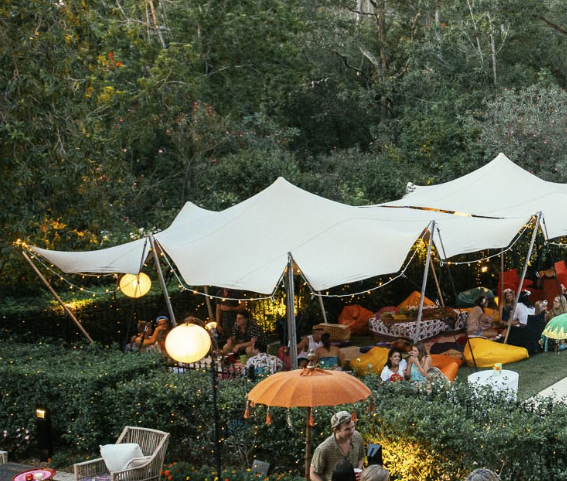 Sunshine Coast tent and marquee hire including the areas of Maleny, Montville, Maroochydore, Coolum, Noosa and beyond. The Nomadic stretch bedouin tents are ideal for all events including weddings, parties, functions, corporate happenings and anniversaries. These tents are stylish and versatile and can be put up on a variety of level and uneven ground. They are also ideal for events of different sizes. Enquire with us now for more information on our full range of marquees and services. Visit our Nomadic Tent Hire website for a complete view of our marquee hire services and packages. Email us in the field at right – please ensure you add our business name to the email. Or Phone 1300 160 566 for a chat.